1.) Beautiful weather! I am always thankful for the warm, sunny days. I live in Canada, so our winters can be pretty harsh. Spring is here and I am loving it! 2.) Miss. E is back to her "normal" self. She is happy, chatty and on the go! I am thankful that she is feeling better! 3.) A lovely Easter. I was fortunate to spend Easter with my family and it felt amazing. I feel so peaceful after a good day with my fam-jam! 4.) Miss. E says "Hi! ", now.and it is positively adorable! 5.) One morning this week, after waking up, Miss. E clasped my face in her hands and proceeded to give me 5 slobbery kisses. It was sweet and unexpected. Made my day! 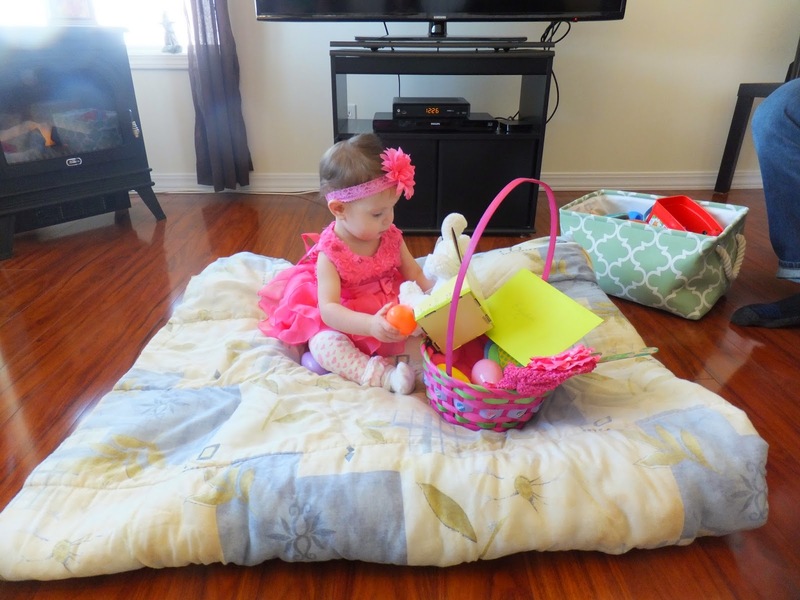 My little lady opening her Easter basket from her Grandparents. Want to join in on High Five For Friday? Link up with the ladies below! Oh how sweet! What awesome moments. I love the spontaneous kisses. They are totally slobbery and unexpected, but so cute! And I love it when kiddos start to say hi. They become so friendly :) Hope you had a wonderful weekend!! I love the spontaneous affection as well! It makes my heart want to burst! Thank you for stopping by!